We weren't able to get the Player introductions portion of the Home Opener Saturday on the broadcast as it was during our chat with the Coaches during the pregame show - if you missed it, check out Kaicee's video below. After player introductions with the lights dimmed the Bulldogs and Kings got things going with good pace over the opening minutes, although there wasn't much early in the way of offensive chances. That would change in a hurry as the Kings made it 1-0 just over four minutes into the game as Jarryd Leung intercepted a play up the boards up the left wing in the Dogs zone and walked to the net un-touched where he wristed one off the glove of Christopolous and over the line. The goal was un-assisted, at 4:14 into the first period. The Bulldogs would get a power play chance three minutes later and although they had several good looks, they appeared to be guilty of looking for the pretty play too much and not just getting pucks on net. The Kings would go to three straight power plays through the period, and the Bulldogs did a very good job of killing the first two opportunities off, and the bulk of the third one, but the Kings would connect on the advantage with less than 20 seconds remaining in it to make it 2-0 as a Carmine Buono shot from the point off a faceoff win was deflected past Christopolous by Alex Jackstadt. Curtis McCarrick also drew an assist on the play at the 16:31 mark of the first. The Bulldogs would be awarded a power play of their own with less than two minutes to go in the frame and showed good urgency and generated several good chances but they couldn't beat Brett Magnus or get a bounce around the net as the first ended with the Kings up 2-0, and leading in the shots as well 13-9. The Bulldogs came out with an increased urgency in the second period, but despite a better period and several great offensive chances they were unable to hit the net through the first half of the period, coming painfully close on two occasions where the puck either hit the post or just danced across the goal line during an extended scramble. Their efforts would be finally rewarded with just over three minutes to go in the period at the end of a long shift in the offensive zone as Drew Blackmun walked out from the right side and looked to the point before snapping one quickly through the legs of Brett Magnus. Assists on the play went to Mitch Makin and Garrett Halls at 16:54 of the second. As it always seems to happen at the Dog Pound, a goal goes to the Dogs legs and wakes up the crowd. The Dogs would go to a power play shortly afterwards where they tied the game as Evan Tironese took a pass at the right point, and put an arm up seeming to indicate that there was no traffic in front of the net. A split second later he would blow a slap shot top corner over the glove of Magnus. Kurt Gosselin would pick up the only assist on the play at 18:27 of the second, for a 2-2 tie after two periods. The Dogs out shot the Kings in the second 19-8 for a two period total of 28-21. 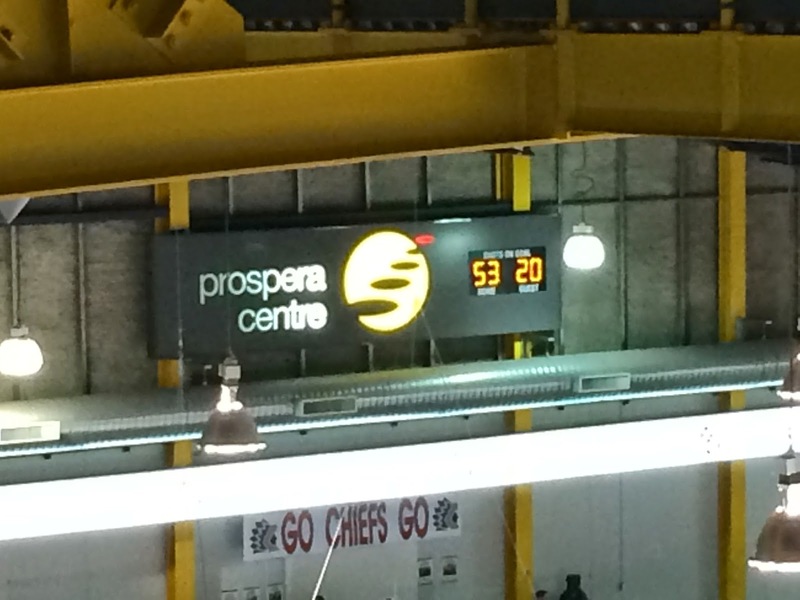 The third period saw the Dogs continue to control the majority of the play, but it wasn't until just past the midway mark of the period that they scored to get their first lead of the game - and of the season, just past the midway mark as Kurt Gosselin threw a puck on net that was stopped by Magnus. The rebound came out to both Eric Margo - who earlier in the shift had a big hit to keep the attack going - and Zak Bowles, who were both stopped. Darian Henry followed the play and fired it home past a down and out Magnus to make it 3-2 at 10:09 of the third. Margo and Gosselin would pick up the assists. The Dogs didn't hold the lead for long, as the Kings connected on the power play just minutes later. After a great save on a wide open change in the slot by Christopolous, the Kings would score on the next shift on a perfect cross-ice set up that was roofed by Jacob Pritchard top corner from the right circle on a Jarryd Leung feed. Stephen Hiff also drew an assist at 12:51 to make it 3-3 on the power play. The Bulldogs would react well to seeing their lead evaporate, as they pushed back on the very next shift. The score would stay that way until the late stages as the game tightened up. With overtime looming, the Dogs would take the lead back when Chris Schutz accepted a Scott Clark pass just off the top of the crease and scored on a spin-around no look backhand off the post and in to make it 4-3 with 1:36 left on the clock, with Evan Tironese also drawing an assist. The Kings would get their goalie out for the extra attacker with a minute to go to look for the equalizer but the Bulldogs did a solid job of shutting them down and winning the battles to not give up any big chances. One more draw with 20 seconds to play saw the Dogs kill the clock when Everett Putz dove to chop the puck out of the zone to kill the rest of the time on the clock. 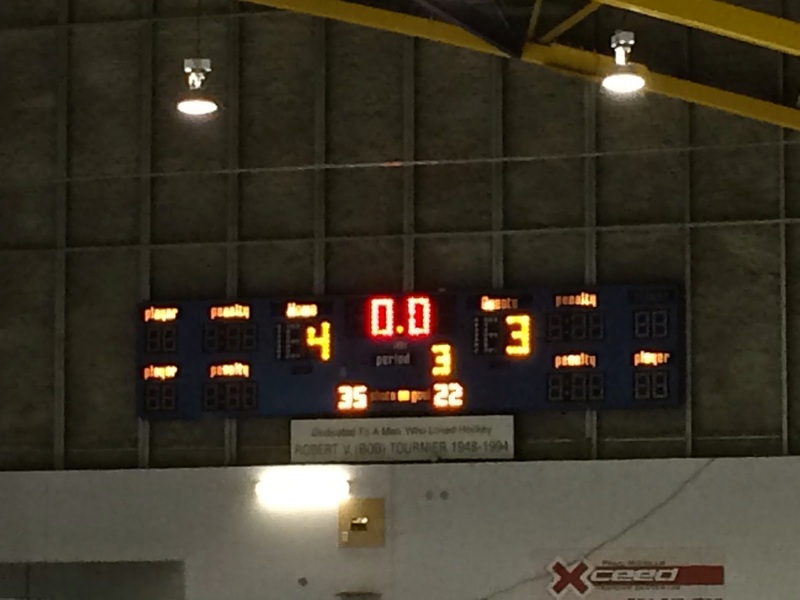 Final shots favoured the Bulldogs 41-29 with Billy Christopolous and Brett Magnus being the goalies of record. The Dogs went 1 for 6 on the power play while the Kings went 2 for 6. The Dogs are next in action Friday night in Victoria. It's the first game on Dog Pound ice for the 2014-2015 season tonight when the Bulldogs (0-2-0-0, 5th Island) host the Powell River Kings (0-2-0-1, 4th Island) at the Multiplex. It's an exciting time for new players to play at home for the first time, and exciting for the returning players who know what the building is all about. I'm of course biased - there is great atmosphere around the entire league - but there is simply no better place to watch a game! 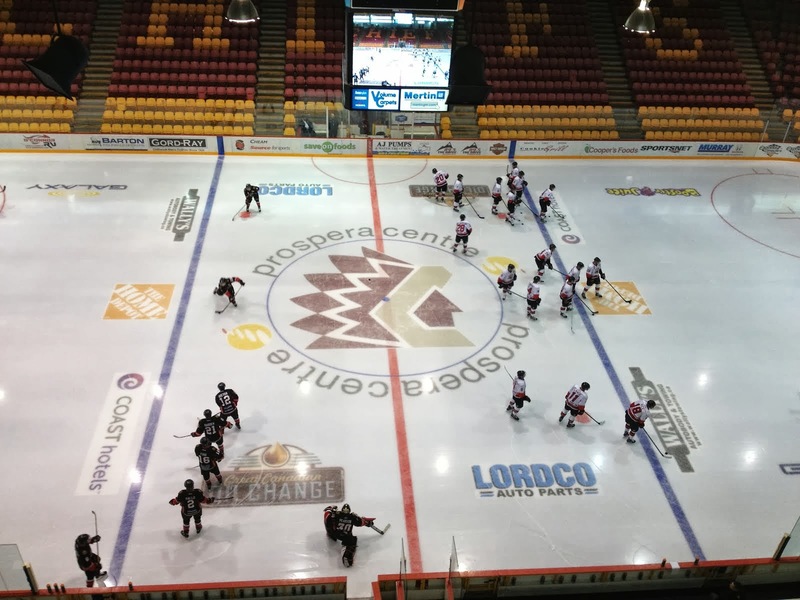 The Bulldogs are coming off back-to-back one goal losses against Penticton and Prince George at the Showcase, both games fighting back from four goal deficits. I was certainly impressed with the battle back and no-quit attitude shown..How couldn't you be? At the same time, it's not a game that you want to play too often if you want to win more games than you lose. It's just such a high level of hockey and the line is so fine between winning and losing that as cliche as it sounds - you need a full 60 minute (and sometimes more) consistent effort if you want to win. Fans are also encouraged to get to the rink early tonight to take part in the Tail Gate Party/BBQ to benefit Raise A Reader getting underway at 5:00pm. 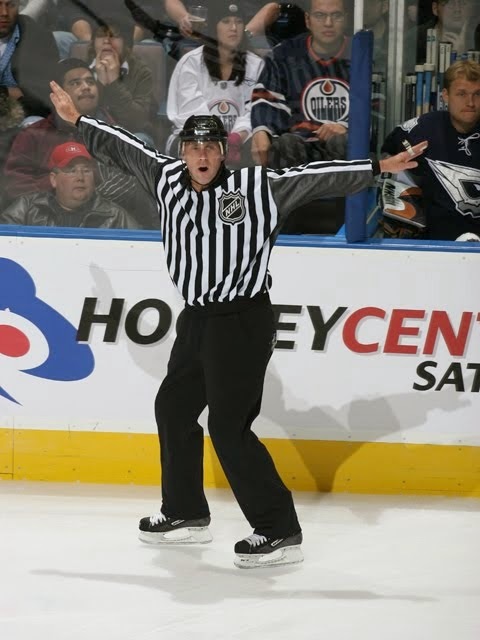 Tonight's 2nd intermission guest is long-time NHL Linesman Brad Lazarowich ( over 2000 games) who is also the BCHL's Assistant Director of Officiating under Derek Adams. The interview is with Jeff Patterson, and is from last week's episode of BCHL This Week on TSN 1040. Don't forget to catch the show this morning, and every Saturday Morning at 9:30 on TSN 1040. The league sure is lucky to have someone like Lazarowich mentoring the league Officials. Coming from the BCHL and ending up in the show, he's a perfect example to the guys on what you can achieve if you do it right! 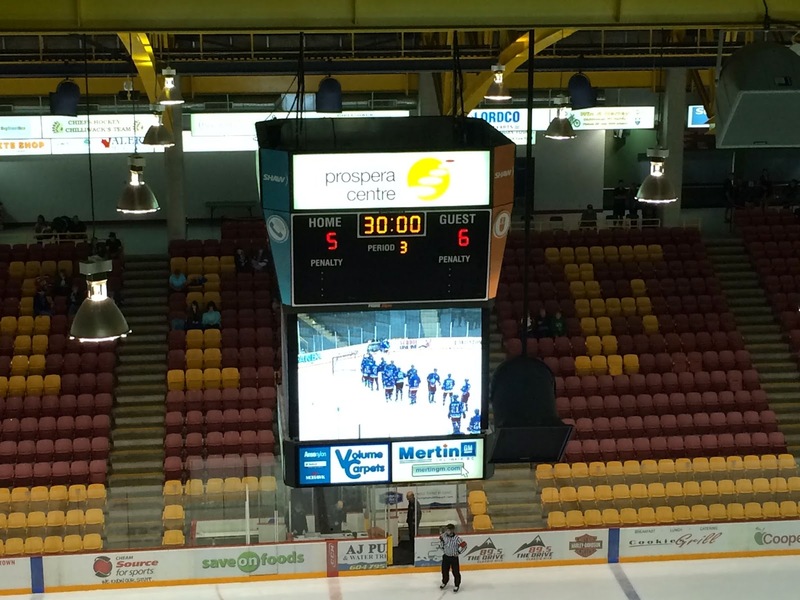 Dogs valiant comeback falls short for second straight day, Spruce Kings win 6-5. Another great start for the Bulldogs, as they had the Spruce Kings hemmed in their zone for the first minute of play and had several good chances. They would promptly take a penalty in their own zone, and the Spruce Kings would make them pay on the man advantage on a cross-ice pass that it looked like Nathan Warren might have had a good piece of with his glove, but it just trickled over the line. Justin Rai would get credit for the marker, with Chad Staley and Matthew Stief picking up the assists at the 2:33 mark. Despite finding themselves in a hole early, the Bulldogs pushed right back and continued to control the bulk of the play. They went to a man-advantage of their own and had nothing but chances over the duration of the full two minutes, but Alex Brooks-Potts was fantastic in the Spruce Kings net to keep it 1-0. Less than a minute after the power play had elapsed, the Spruce Kings built their lead against the flow of play as the Bulldogs turned the puck over in their own end and Nathan Warren made a great first save on a wide-open Chad Staley in front. He couldn't find the rebound though as Jeremiah Luedtke drove the net and out-fought the Bulldogs defense to poke it home on the backhand. Justin Rai also drew an assist on the play at 11:19 of the first. The Spruce Kings would be penalized in the scrum after the goal, so the Dogs went right back to the power play to try and get back in it. That chance would be short-lived though, as less than 30 seconds later Darian Henry would pick up an unsportsanlike conduct penalty for something that occurred after the whistle. The Bulldogs would once again continue to control the play and pepper Alex Brooks-Potts with shots during four-aside hockey, but they couldn't find the back of the net. Just over a minute later during five-on-five hockey the Spruce Kings again scored against the flow of play as Michael Buonincontri snuck in on a partial breakway and somehow fought one through Warren while fighting off the Bulldog defender. Cole Todd and Taylor Allan picked up the assists on the goal at 15:06 of the first as it was 3-0 Spruce Kings, with Billy Christopolous entering the game in relief of Warren to end the first. The score would stay 3-0 Spruce Kings into the second, with the Dogs leading the shots 20 to 9. The Bulldogs got off to a fantastic start to the second, getting on the board just half a minute in when Kurt Gosselin went to the net and one-timed a rebound up and over the blocker of Brooks-Potts, with assists going to Scottie Clark and Tyler Povelofskie at 31 seconds of the second. The Bulldogs weren't able to built on it though, as just three minutes later it was 4-1 Spruce Kings when Brogan O'Brien raced in on the breakaway where he went top corner with a beautiful backhand over the glove of Nathan Warren, who came back in to start the second. Three minutes later it was 5-1 as Chad Staley drove the net on a partial break and jammed one home through/around Warren, with assists to Cole Todd and Michael Buonincontri at 6:02. The Dogs did well to stop the bleeding and stay in the game, finally getting on the board on the power play with five minutes to go in the frame when Garrett Halls put a wrist shot on net from the top of the right circle that found it's way over the line through the legs of Brooks-Potts. Scott Clark was given credit for the goal, but he clearly didn't touch it, so let's call it Halls from Evan Tironese and Kurt Gosselin at 14:52 of the second, making it 5-2. Again the Bulldogs couldn't build on the goal, as they were again caught up ice resulting in an odd-man rush the other way that saw Justin Rai cut across the slot and rip one up over the blocker arm of Warren. Assists on the play went to Marco Ballarin and Trevor Pereverzoff at 18:57 of the second for a 6-2 Spruce King lead after 40 minutes with the Dogs leading the shots 32-19. The first couple of minutes of the third period were evenly played back and forth, but in short order the Bulldogs started to dominate the play. They would get rewarded just under five minutes into the period after a long containment shift in the attacking zone when Zak Bowles picked up a shot that missed the net and jammed home a wrap around before Brooks-Potts could get back to the post. Eric Margo and Darian Henry drew the helpers at 4:55 as it was 6-3. The Dogs continued to push and carry the play and after countless chances to score they were rewarded on the power play when Scott Clark found a rebound off the post and one-timed it into the open side. Kurt Gosselin and Tyler Povelofskie picked up the assists at 7:39 of the third to make it 6-4. The Bulldogs certainly had the Spruce Kings attention once they cut the deficit in half, but they still continued to control the play and pepper Brooks-Potts with a tonne of pucks. After several near-misses somehow stayed out, they finally trimmed the gap to one just after a Prince George time out was taken as Evan Tironese deflected home a Garrett Halls shot from the right point to make it 6-5, with Tyler Povelofskie also picking up an assist with 4:47 to play in the third. The Spruce Kings did a good job to kill time over the next couple of minutes as the Dogs struggled to once again hem them in their zone. With 1:30 left the Bulldogs used their time out to talk strategy and get the goalie out for the extra attacker and did a good job to gain the zone and generate several chances, having a couple near misses on deflections and scrambles. 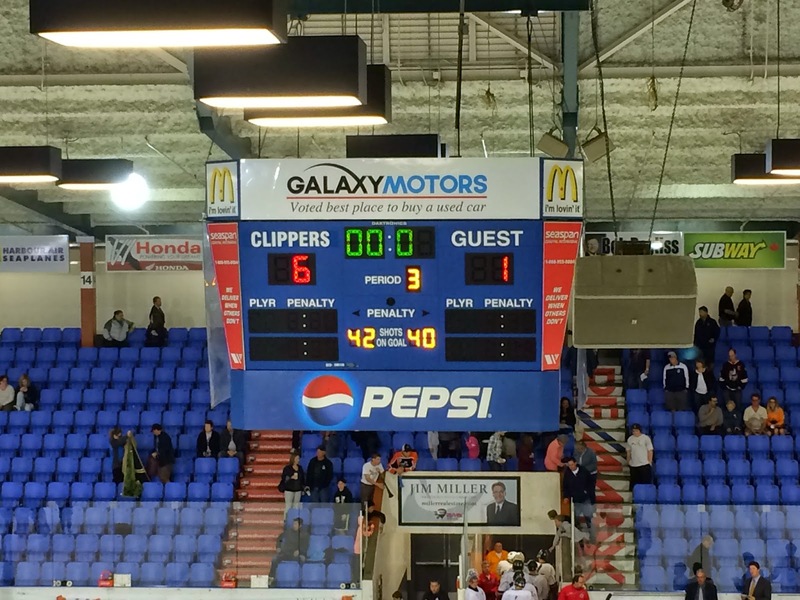 In the end, it's as close as they would get as the Spruce Kings held on for the 6-5 win. Shots in the third period were 21 to 1, no - that's not a typo, for a game total of 53-20. Alex Brooks-Potts picked up the win while Nathan Warren took the loss playing about 54 minutes. The Bulldogs went 2 for 7 on the power play while the Spruce Kings went 1 for 3. 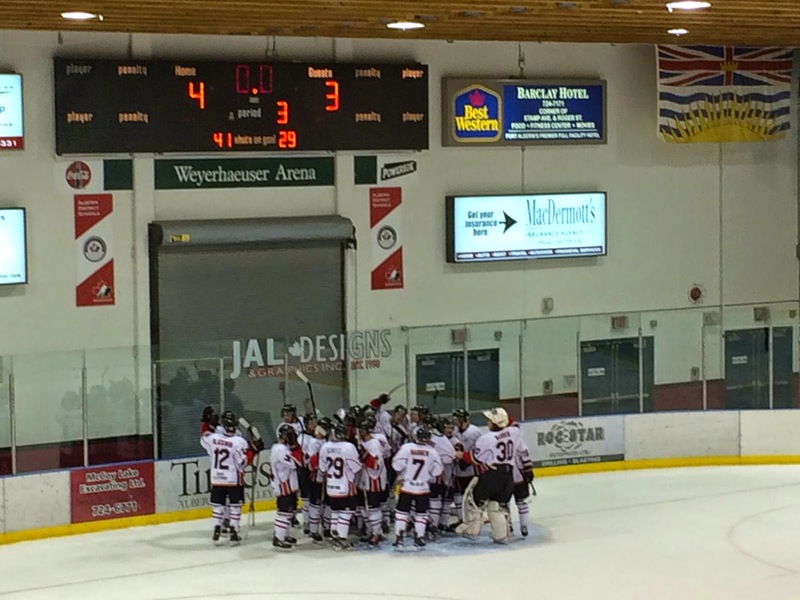 The Bulldogs next see action Saturday night when they host the Powell River Kings for their Home Opener. 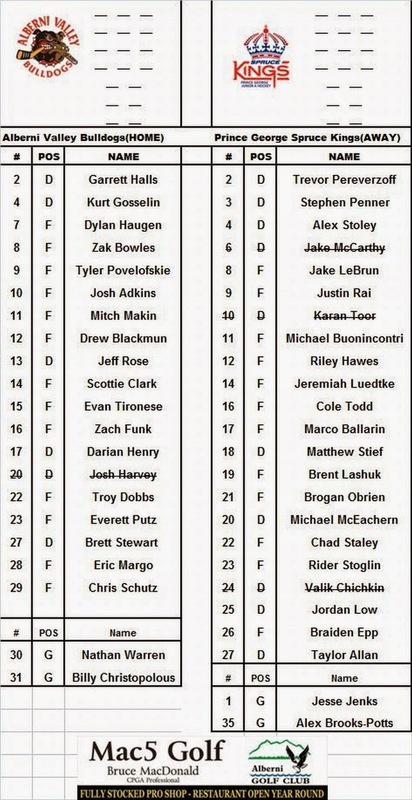 Experimenting with posting line ups here pre game on the blog! This work? Click to anlarge - right click/view image zoom. 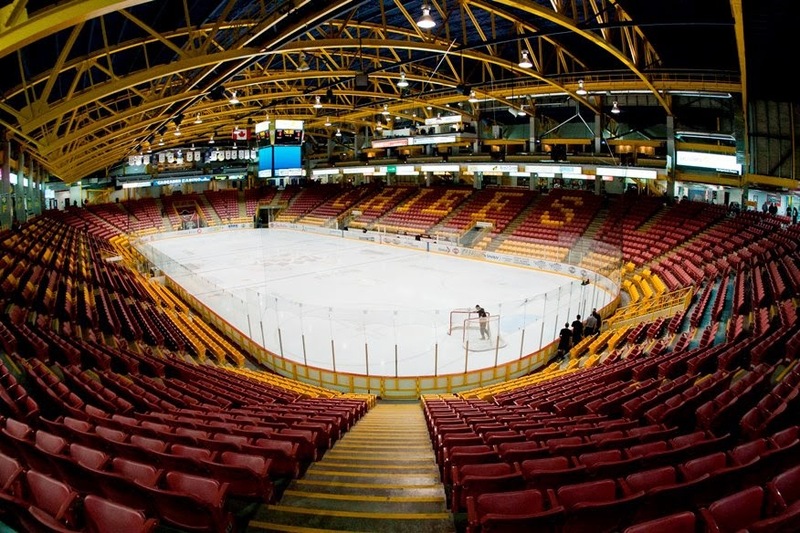 After a heartbreaking 4-3 loss to the Vees yesterday afternoon It's right back at it today for the Bulldogs as they conclude their appearance in the Bauer BCHL Showcase this morning when they take on the Prince George Spruce Kings in the big rink inside the Prospera Centre in Chilliwack. I think it's a pretty neat comparison between the two photos and the vastly different perspectives we all see the game from. I'll be looking at the game from the image above wayyyy up in the rafters, while the players will see it pretty close to the image on the bottom, right down in the "trenches" so to speak. And no, I'm not comparing sports to warefare, it's just a turn of phrase! With it being an 11am start time today, we'll call it a "Hockey Brunch". For a late riser, 11am wouldn't be considered too late for breakfast, and for an early bird 11am wouldn't be considered too early for lunch but I'm figuring for your average wake-up time it has to be considered not either-or, but in-between! For some listening and watching today from the Eastern time zone, it's well into possibly afternoon nap time, if it wasn't all so exciting of course! It's certainly a change of pace for the players. I would call it a change of routine, but it's Game 2 of the season so hopefully no one is going to be bothered too much. It's a different pregame meal today than most, that's for sure with bacon and eggs and oatmeal most likely replacing pasta and chicken, etc. One would think the Bulldogs would have an edge with the early start time as they got off the ice and hopefully shut down earlier last night than the Spruce Kings, who played at 6:30 last night. Get your late breakfast or early lunch and catch all the action on Pacific Chevrolet Bulldogs Hockey on 93.3 The Peak FM with the Jiffy Lube pregame show kicking off at 10:45 and the puck dropping at 11:00 with myself and Bulldogs Educational Advisor Tom McEvay. 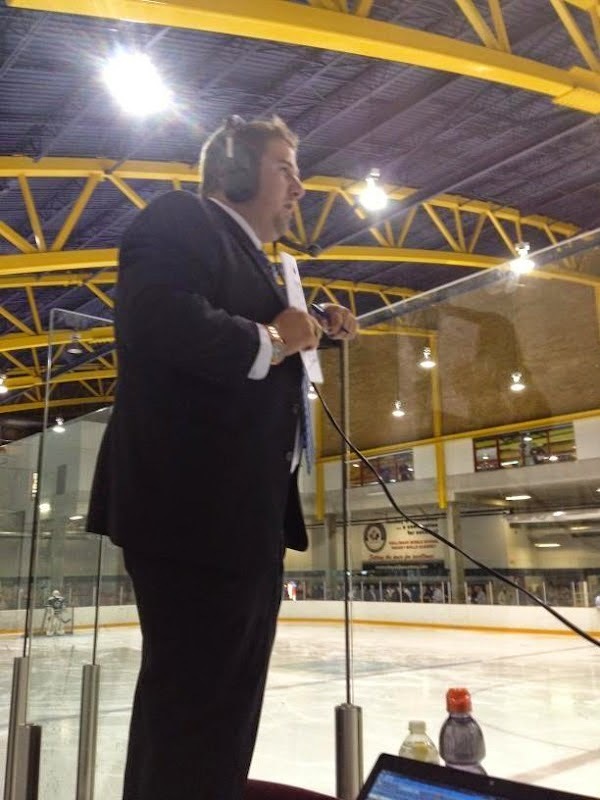 Today's 2nd Intermission feature guest is BCHL Director of Communications Brent Mutis. A fantastic pace from the get go in this one as the Bulldogs didn't appear to be nervous due to the big stage that the Showcase offers as they came out with great pace to their game off the opening puck drop. The fact that they drew a penalty just 40 seconds into the game might have also helped in settling everyone down. The first two sequences off the start of the power play were good, but the Dogs struggled and the Vees did a good job the rest of the way to not allow them a clean entry into the zone to get set up. The best early chances for the Bulldogs might have been during four-on-four hockey when the Vees were penalized just 16 seconds into their first power play of the game. The Dogs had several good looks to shoot but instead passed off - the Vees would illustrate the value in a simple shot on net less than a minute later as they opened the scoring when Tyson Jost jumped on a rebound at the side of net off a Mike Lee point shot that he slid home to make it 1-0 at the 10:39 mark with Liam Finlay also drawing an assist. The Vees would build the lead to 2-0 seven minutes later, just seconds after the Bulldogs had done a fantastic job to keep it within a goal when they killed off a two-man advantage for the Vees of just under a minute in duration as Riley Alferd found a loose puck in the slot and scored on a quick spin move, glove stick-side on Christopolous. Assists on the play went to Matthew Serratore and Mike Lee at the 17:13 mark. The Vees led 2-0 after 20 minutes, while holding a 12-3 lead in shots. The Bulldogs came out once again with a great start to the second period but despite several opportunities they failed to capitalize. 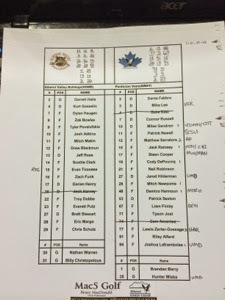 The Vees would build the lead to 3-0 at the 7:18 mark on an odd-man rush as Liam Finlay delayed nicely at the side of the net before putting a perfect pass onto the tape of Tyson Jost in the slot who beat his man to the net to one-time one through the legs of Christopolous. Dante Fabbro also drew an assist on the play. The Vees would push the lead to 4-0 in the later stages of the period when Jost completed the hat trick as he made three Bulldog defenders miss before ripping a perfect shot top corner far-side past the glove of Billy Christopolous. Lewis Zerter-Gossage picked up the only assist at 18:03 of the second. The Bulldogs would get on the board as time expired on the period when the Coaching Staff gambled with an attacking zone face-off while on the power play and 7.4 seconds on the clock as they pulled Billy Christopolous for the extra attacker. The move would pay off as they found the net when Dylan Haugen kept the puck in on the wall for Kurt Gosselin, who set up Darian Henry in the deep slot where he fired one through Miska to get the Dogs on the board and make it 4-1 Vees after 40 minutes. Shots favoured the Vees 16-9 for a two period total of 28-12. The third period once again started well for the Bulldogs as they pushed the pace and got several opportunities around the Vees net. They would capitalize on the rush to make it a two-goal game when Kurt Gosselin head-manned it to Josh Adkins up the right wing where he gained the Vees line and found Scott Clark going to the net where he snapped one top corner, far-side over the blocker of Miska to make it a 4-2 game 6:37 into the third. The Dogs would be sent to the penalty box shortly afterwards, but they found the net anyway as Dylan Haugen blocked a shot at the line and raced in on a shorthanded breakaway where he ripped one short-side off the cuff of Miska's glove and just over the line to make it 4-3, shorthanded and unassisted with 9:40 gone in the third period. The Bulldogs would kill the penalty off - and then kill another penalty off almost immediately afterwards. Embellished, but undisciplined, the Bulldogs certainly could have used the time to work on the attack instead of the penalty kill. Shortly after another successful kill, the Bulldogs looked like they deserved an opportunity of their own on the man-advantage when Troy Dobbs was drilled head first into the boards behind the Bulldog net but no call came from either Referee. The Dogs would push hard for the equalizer in the final minute and change with the goalie out and moved the puck well around the offensive zone but the Vees did a great job of blocking shots as nothing got through to Miska as they made the lead stand for the 4-3 Final. Shots favoured Penticton 35-22 with Billy Christopolous taking the loss in net while Hunter Miska picked up the win. The Dogs went 1 for 4 on the power play while the Vees went 0 for 8. 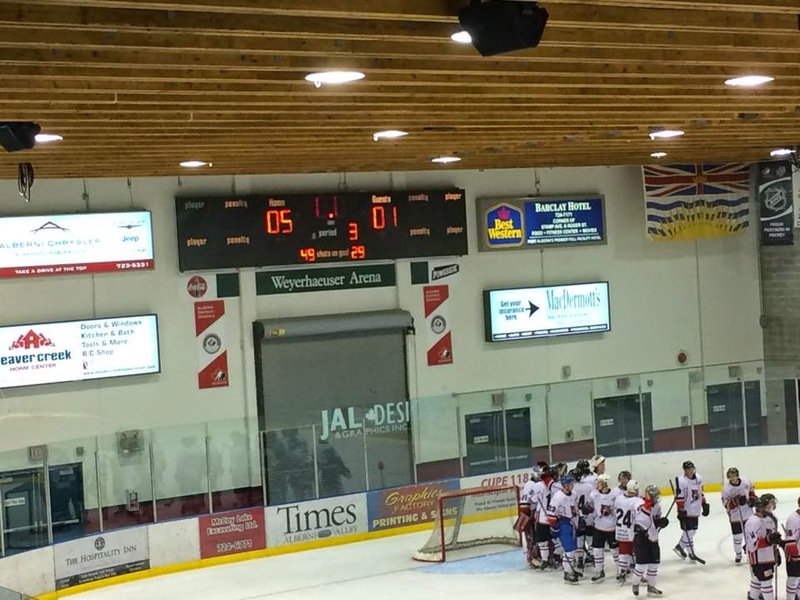 It's a quick turn around for the Bulldogs as they conclude their appearance in the Showcase tomorrow morning at 11:00am when they take on the Prince George Spruce Kings. 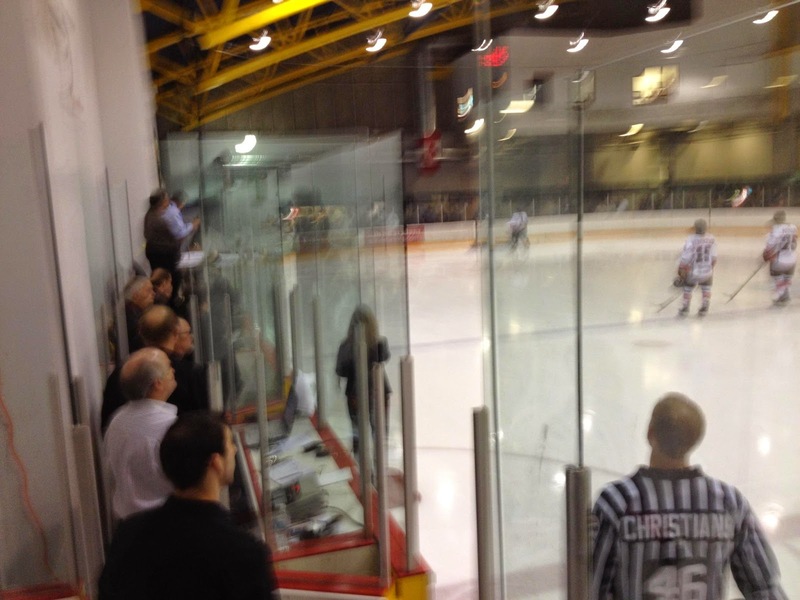 That's the main rink inside the beautiful Prospera Centre in Chilliwack. 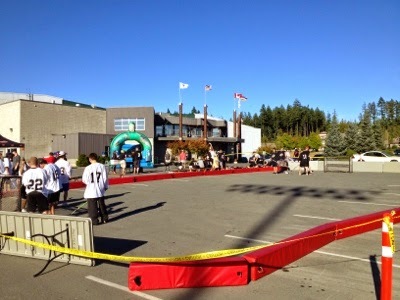 Unfortunately, the Bulldogs won't be playing in this rink for today's season opener against the Vees, (1-0-0-0 after an 11-2 demolition of the Surrey Eagles last night) as they will instead be playing on the secondary ice sheet, also known as the community rink. The Bulldogs will be playing in the big rink tomorrow though. It seems only fair that each team get a game in each rink - last year the Bulldogs were really lucky (or maybe just the broadcaster was) as they got both games in the big rink. 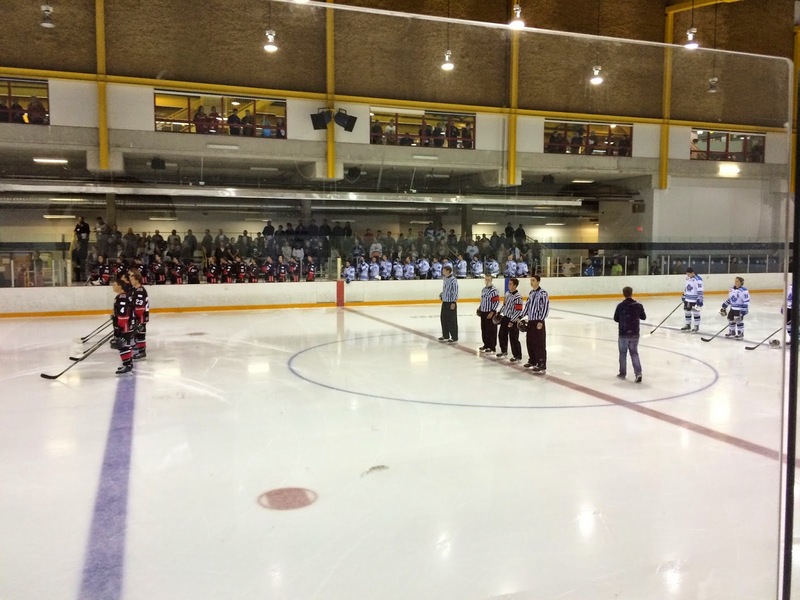 That certainly made up for their appearance at the inaugural Showcase in 2012 when the Bulldogs played BOTH of their games in the secondary rink. Every team except the Capitals gets at least one game in the main rink, it's nice to see the league spread the chance around, not that the scouts wont be all over the place hanging from the rafters in both rinks! Those two pictures give a bit of an idea as to the set up in the community rink. In the end it doesn't really matter, both rinks have the same ice sheet dimensions and the nets are the same size! I think the Bulldogs would play hallway hockey if it got them a win, as they have yet to win a game at the Showcase over the last two editions, going 0-3-0-1. That's all irrelevant and in the past though - today is about a new beginning and a fresh slate. Nothing like the excitement of a new season! I'm sure there will be plenty of butterflies to go around from rookies to vets. It's important to just be ready to play, and to not try to do too much. Just play your game, push the pace, and let the puck bounce how it may. As important as it is to get off to a good start to a season as the Bulldogs found out last year, it's a marathon not a sprint. The new season of Pacific Chevrolet Bulldogs Hockey kicks off this afternoon on 93.3 The Peak FM with the pregame show at 2:45 and the play-by-play to follow at 3:00 with myself and Bulldogs Public Address Announcer Charles Mealey calling all the action and providing the colour, analysis and statistics. Today's 2nd Intermission feature guest is BCHL Comissioner John Grisdale, talking about the showcase and all things BCHL. Lets drop the puck already! Showcase kicks off today, Bulldogs open season tomorrow, Van Isle Ford/Pacific Chevrolet Bulldogs Hockey BACK on THE PEAK! 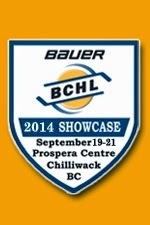 The third edition of the Bauer BCHL Showcase kicks off this afternoon in Chilliwack with four games - Vernon vs Cowichan, Salmon Arm vs Langley, Coquitlam vs West Kelowna and Penticton vs Surrey. 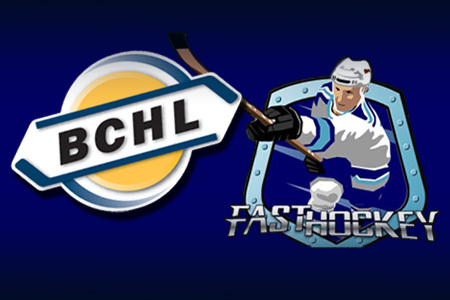 You can listen to all the games through the BCHL website, and you can watch them all through Fast Hockey. 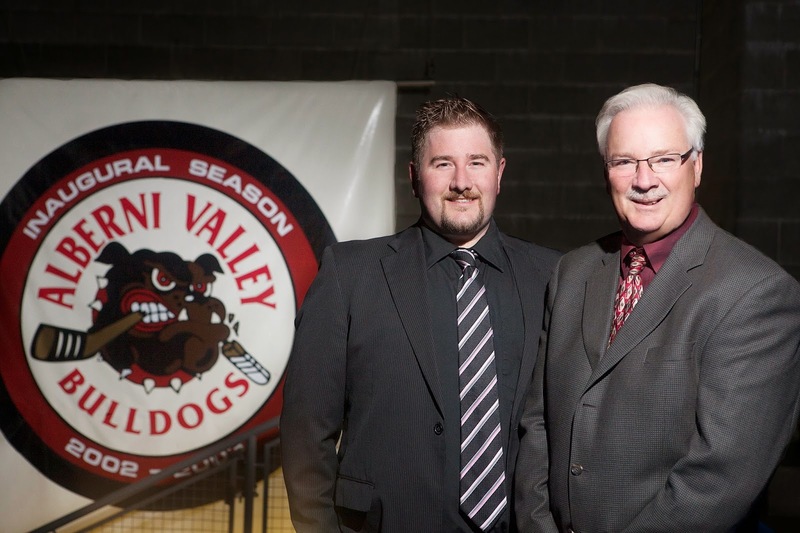 The Bulldogs open their 13th season tomorrow when they take on the Penticton Vees at 3:30. 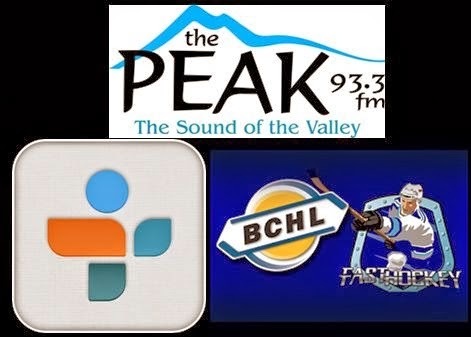 You can catch all the action on Pacific Chevrolet Bulldogs Hockey on 93.3 The Peak FM with the pregame show kicking off at 3:15. Very happy to have Van Isle Ford (home games) and Pacific Chevrolet (road games) back as our title sponsors this year - if you appreciate the broadcasts, thank them with your business! 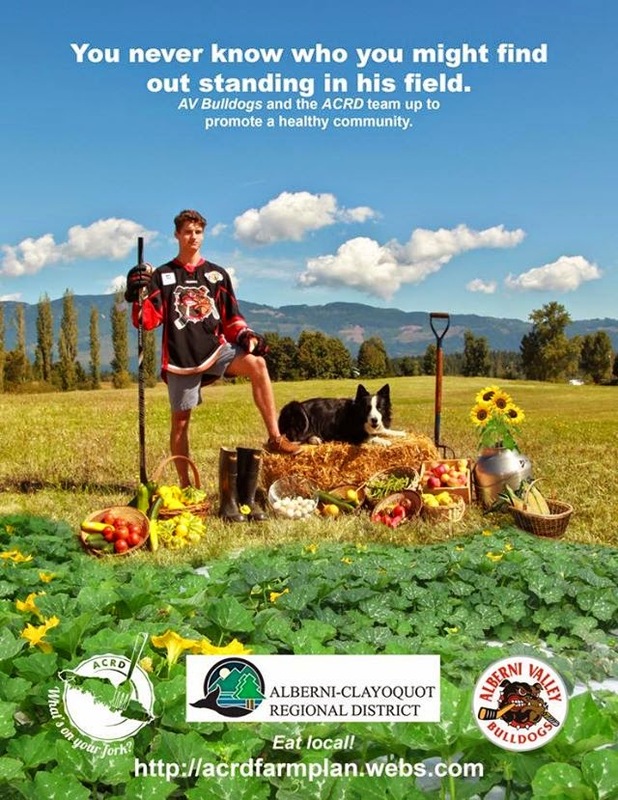 New to the broadcasts this year (and still relatively new to the Alberni Valley) is the Save on Foods Bulldog Power Play contest. Enter your name in the draw box at Save on Foods. Every time the Dogs go to the power play we will draw a name, and if the Dogs score, you'll win a Save on Foods gift card! If you are interesting in being a sponsor on Bulldog Broadcasts, the more the merrier - contact our sales staff at 93.3 The Peak at 250-723-2455, we have plenty of options from big to small available! Also pleased to have a couple of great guys back in the booth with me in Bruce MacDonald and Dan Tisserand providing analysis and statistics! Talk to you tomorrow from Chilliwack! A great way to end the preseason for the Bulldogs Saturday as they picked up a 5-1 win over the Nanaimo Clippers at the Dog Pound, exacting some revenge after a lack lustre ( and that's putting it kindly) 6-1 loss to the Clippers in Nanaimo on Friday night when pretty much no one looked good. On Saturday, everyone looked good. That's how it goes sometimes with winning and losing. It was nice to see Billy Christopolous have a solid game in net, and it sure was nice to see Evan Tironese back in a Bulldog sweater and doing some of the things he did out there Saturday night. An elite player without question - he will be fun to watch this year. Being a year older than we last saw him, I'm confident he'll be ready to put up with the stuff that elite players have to deal with. I certainly don't agree with it and don't enjoy the fact that the impact guys have to deal with the abuse that they get, but it seems to goes with the territory at every level of hockey. If you are an impact player, team will try to get you off your game. It takes a higher level of mental strength and maturity than I have to put up with the attention and shenanigans they face, but I believe Evan has it and has the support of his team, and teammates as well. Lets drop the puck and get this thing going already! It's a critical week of practice leading up to game #1 on Saturday afternoon, as EVERYTHING will be ramped up a couple of notches. The intensity, the speed, the level of play from the opposition, the pressure, etc etc etc. It's up to the Coaches to prepare the players as best they can for the games when all of a sudden points are on the line. I can't wait! 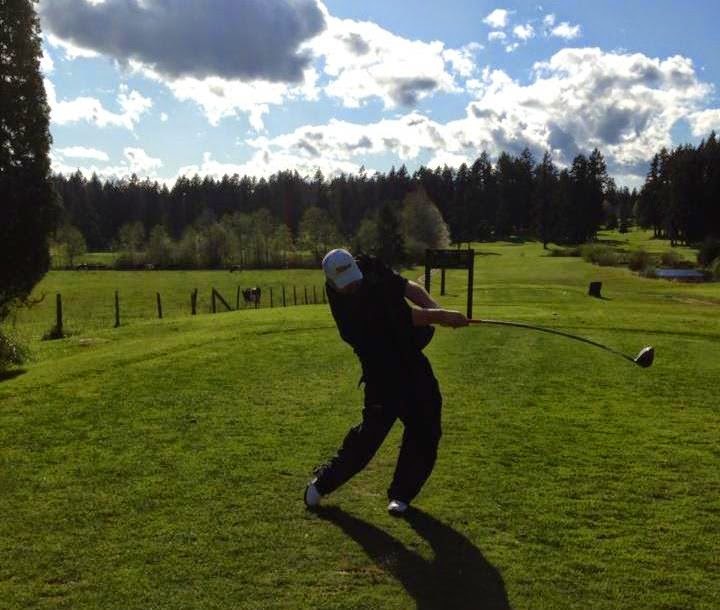 What a great time at the Alberni Golf Club yesterday for the 3rd Annual Bulldogs season-opening golf tourney. Huge thanks to everyone that came out and played, and of course all the volunteers that put it together and the sponsors that made it happen. 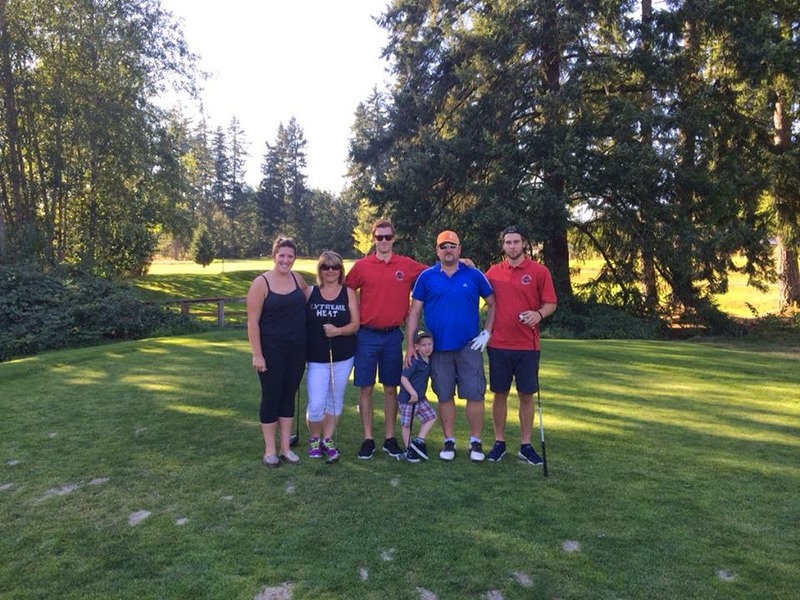 Pictured above is the winning team of myself, Laurie Smillie, Everett Putz, Josh Adkins my little guy Griff and our honorary caddy Deserray McClary. I was pretty surprised that our score of 28 was the winning one - I thought we had a way better chance with our score last year but a couple teams went really low. Everyone had a couple great shots at key moments, Josh Adkins got a drive over the creek on #9 which was really tough from the back tees, and he got one to stick on the green on the approach which was even tougher. Laurie won the Ladies Long Drive which really helped us on #7 and Everett almost holed one out for Eagle on #3...I'm still actually not sure how it didn't go in as it hit the pin, and went around-the-world around the cup but somehow stayed out! I wish I would've seen the highlight of the day as Head Pro and Colour Analyst Bruce MacDonald holed one out from 240 PLUS yards for an Albatross on the Par 5 third hole. More rare than a hole-in-one. How they didn't win the tourney after that I don't know! Another highlight was Mitch Hawes putting one within INCHES of going in off the tee on the 8th hole. Almost an ace on a par 4. 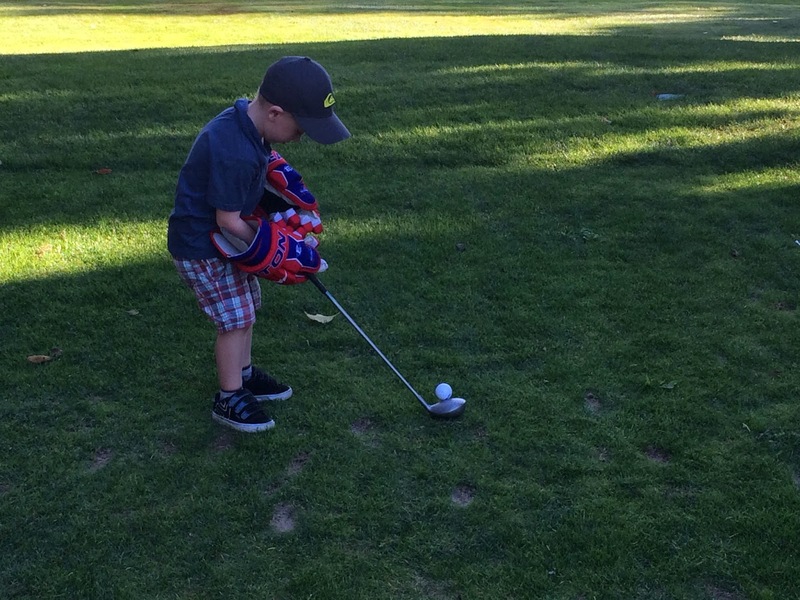 That's Happy Gilmore stuff, even if they did have us hitting off the Women's tees on that hole! Fun time all around. Good to get the "fun and games" out of everyone's system now that it's right down to work! Update - just a couple pictures of the community events the guys were involved in yesterday. 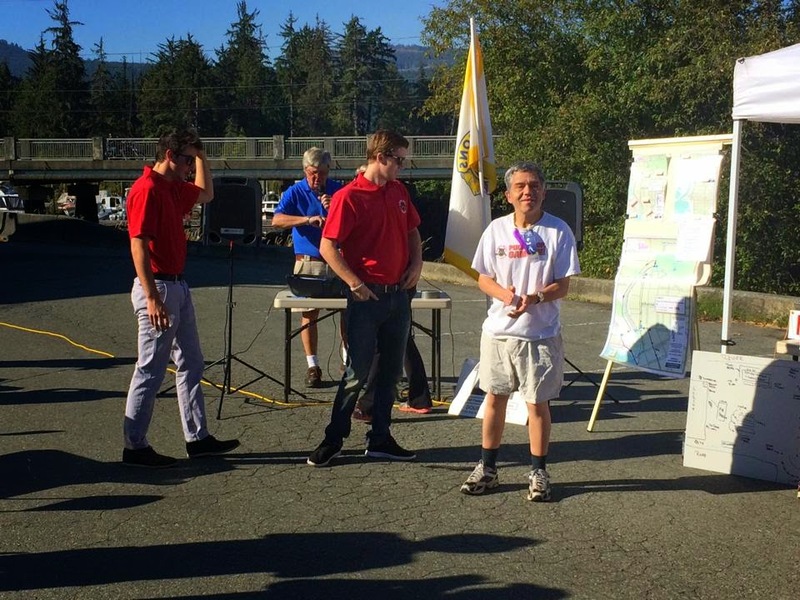 The team has sure done a fantastic job being champions of the community in my opinion. It's one thing to ask your community to come out and support your games. Its another thing entirely to get out and be EVERYWHERE supporting your community with all their events. That will make more of them come and cheer for you, one has to think. They know you, they have a connection to you, it makes a difference! I'll be busy this week putting all the broadcast elements together at 93.3 The Peak FM control and I'm also hoping to be able to devote some time to working on fine tuning the blog. Thanks again to everyone that commented over the weekend that they were following along, and thanks for the comments and feedback as well received via email. Doing my best to make the comment process easier. If you like the blog - please thank the sponsors of the blog with your business - they make it happen, as much as you all motivate me to keep putting in the effort and updating it....and last but not least if you like the blog click the donate link in the upper right hand corner, nothing is expected everything is greatly appreciated! evening from the Frank Crane Arena... Updates to follow ... Let's start with a line up! Click the above line up image to enlarge it, and right click it again and select VIEW IMAGE for an even bigger view! Not a good start for the Bulldogs, as they give up a 2 on 1 rush in the opening seconds - they dodge a bullet as the shot hits the bar and stays out. Seconds later they give up another odd-man rush as Eric Rempal walks in alone on net where he goes top corner, far side over the glove of Nathan Warren. Yanni Kaldis picks up the only assist :55 seconds in. Clippers take a 2-0 lead at the 7:18 mark on a nice feed out front to the slot for Jake Wozney from Anthony Rinaldi. Shots are 9-3 Clippers, and they have definitely carried the bulk of the play. Score after 20 minutes 2-0 Clippers, shots favor the Clippers 12-4. Clippers are 0 for 3 on the power play. Bulldogs didn't get a power play. Bulldogs certainly deserved a chance, but the officials have done a reasonably good job of maintaining order when tempers seem to be a little high. No scoring in the second period so far, 7:00 in. Shots 16-10 Clippers. ROLL CALL time - add a comment - is anyone reading these updates, and should I keep doing them? Where are you checking the blog from? UPDATE - Midway point of the game, still 2-0, shots 18-13 in favour of Nanaimo. Clippers change goalies, Cameron Pateman comes out, Jacob Severson comes in. Clippers take a 3-0 lead on the power play as the Bulldogs lose their discipline a bit. Jacob Hanlon gets credit for the goal as it appeared a point shot hit traffic in front. Sean Buchanan picks up the assist at 13:20. The Bulldogs take yet another penalty on the ensuing shift, but kill the bulk of it off before the Clippers take a penalty. Just as four-on-four hockey ends and the Dogs go to the power play, they find the score board as Kurt Gosselin drives down the wing and in on goal where he slides one through Severson. Scottie Clark picks up the only assist at 15:34 of the second. Immediately afterwards, yet another Bulldog penalty. Clippers going to their sixth advantage, leading the game 3-1 with 3:44 to play in the second. Clippers score on the power play to go up 4-1 as a fluttering puck is swung at and missed by a Bulldog defender but perfectly bunted on net by Devin Brosseau through the legs of Nathan Warren. Assists on the play went to Sean Buchanan and Spencer Hewson at 16:59 to make it 4-1 Clippers. On the next shift, the Clippers are penalized. With a power play pending, a Bulldog gives an excuse me tap to the back of a Clipper. By the letter of the rule book, a penalty, but not a lot of discretion shown by the Referee. Having said that, don't give the Referee a chance to give you a penalty - some have shown that they have a track record that they barely need a reason to give you a soft one. Better discipline is needed - as soft as the call was. Second period ends with the Clippers up 4-1, and leading the shots 26-20. Clippers are 2 for 6 on the power play, Bulldogs are 1 for 2. I'm somewhat surprised no one posted a comment yet....you must be all watching the Pay-Per-View Broadcast! No update in the scoring, 5:54 into the third period. Bulldogs are going on their third power play of the frame. They just had a 5 on 3 advantage. The Officials have given them every opportunity to get back into this one, but they have yet to capitalize. Clippers score on the power play to take a 5-1 lead at 8:24 of the third on a nice cross-ice set up finished off by Edwin Hookenson. Assists on the play went to Brendan Taylor and Jake Jackson at 8:24 of the third. One item of mention, both teams began the third period with five defenceman as Troy Dobbs was ejected along with Brett Roulston for a second period dust-up. More rough stuff on the shift after the Clippers goal. Tempers are really high - not sure why, maybe just impatience to get the season really going. There certainly isn't much to be gained, and lots to be lost at this time of year when it comes to the rough stuff, just my 2 cents! It appears the Bulldogs are now down to four defenceman as Darian Henry was just ejected, presumably for his part in an after-the-whistle skirmish. Clippers take a 6-1 lead late in the game when Sheldon Rempal walks in on net and slides one past a prone Nathan Warren. Nicholas Carrier with the helper at 15:35. There would be no scoring the rest of the way, with the final shots favouring the Clippers 42-40. I had the Bulldogs at 1 for 7 on the power play and the Clippers at 3 for 7. The teams meet Saturday night at the Dog Pound for the rematch to conclude the Exhibition schedule. Thanks for following along tonight! I got some emails - but no comments...with the email feedback I have changed some settings so hopefully it's easier to leave comments now! 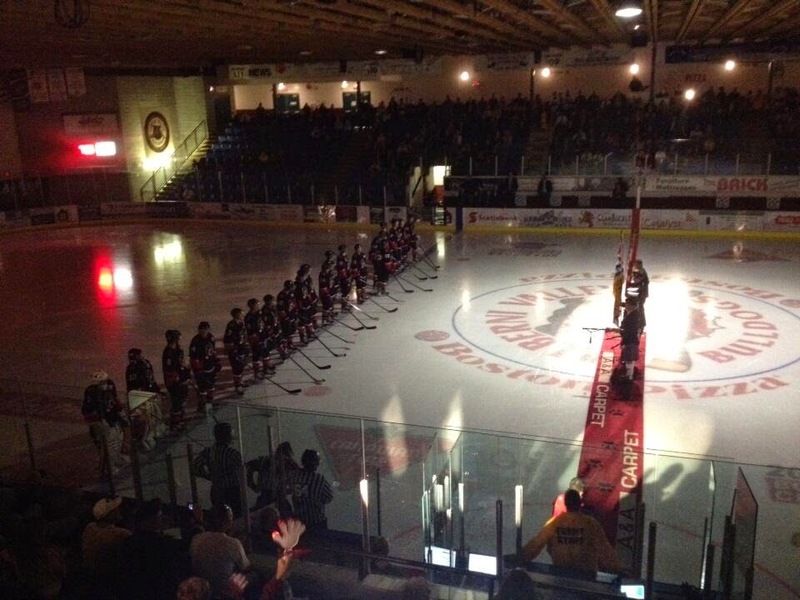 Fasthockey broadcasts - Dogs in Nanaimo tonight, home against Clippers tomorrow...busy BUSY weekend! Don't forget you can watch both games tonight and tomorrow night through Fast Hockey - at www.fasthockey.com Dan Marshall and Darryl Major will have the call tonight, while Bruce MacDonald, myself, and Dan Tisserand will bring you the action and stats tomorrow night. As I previously mentioned here on the blog - this is a FAST HOCKEY ONLY broadcast, not the full-meal deal! Just a little heads up - this will be no way in any shape or form what our "real" broadcasts will be like when we are professionally produced and operated through 93.3 The Peak FM studios. We are doing it on our own time for you the fans to follow the team, and also as a way to shake off the rust and do some tests and make sure all the Fast Hockey Pay-per-view broadcast equipment works. So don't expect a pre game or post game show or intermission features or rosters that we have had well in advance for the purpose of preparation, memorization, research, etc . We will do our best to cover all the action though! If you aren't on Facebook, here's a post a put there today of everything on the go right now! The Bulldogs visit Nanaimo to face the Clippers in exhibition action on Friday night before returning home to conclude the pre season by hosting the Clippers on Saturday night. 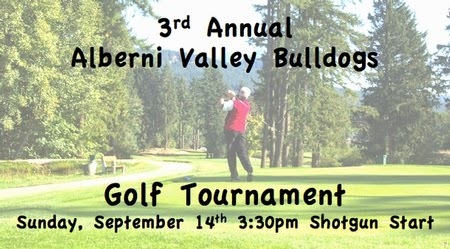 The 3rd Annual season-opening Bulldog Charity Golf Tournament is at the course on Sunday. The Jericho Road Church in partnership with the Christian Reformed Church are hosting a FALL BASH tonight at Jericho Road Church from 4pm to 6pm. Free food, free school supplies - while supplies last - great prizes, face painting, bounce around, and MORE! Also today, the AV Midget Bulldogs are having a BBQ/bake sale/car wash/bottle drive fundraiser at Cap-It from 11 to 4. 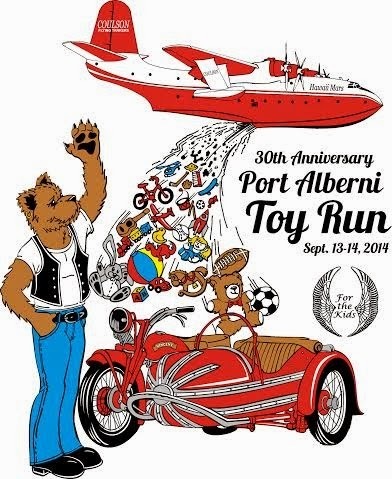 The 30th Annual Port Alberni Toy Run leaves little Qualicum Falls at noon SHARP on Saturday, with the festivities for all ages at Glenwood Centre to follow. Dances to follow that night at the Glenwood, and a sober dance to follow at Char's Landing. 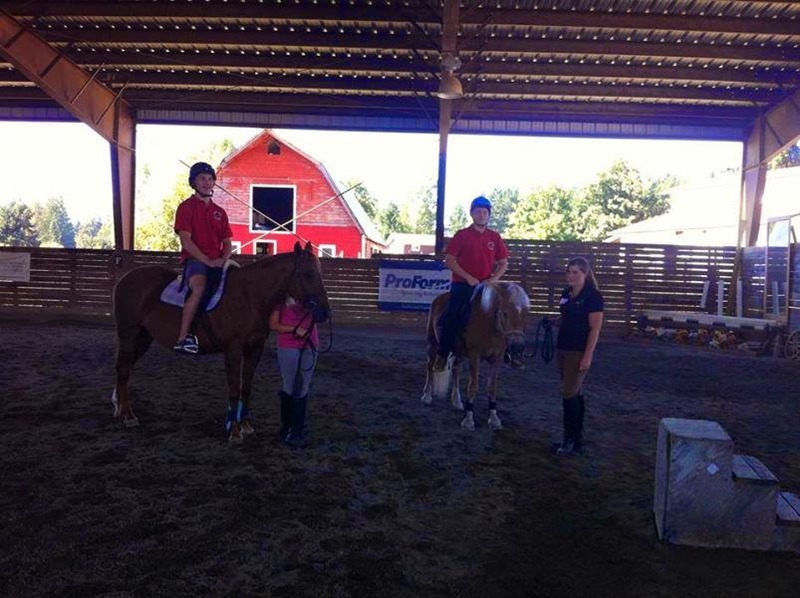 Tickets to the dance at Glenwood will be for sale for riders out at Little Qualicum Falls, and should there be any remaining, they will go on sale at Glenwood following the run. Sunday is the poker run with a live band to follow at Boston Pizza. Also on Saturday, Canada Post Employees will be going door to door in the city picking up non-perishable food items for the People Helping People Food Drive from 8:30 to 12 noon. Just leave your items in a bag at the front door by your mailbox/slot for pick up. Sunday is also the 34th Annual Terry Fox Run. Registration is at the Royal Canadian Legion at 9am and the run is at 10am. Also Sunday, it's Family Farm day! WOW, there is just wayyyyyy to much happening around here lately! The Dogs are in Nanaimo tomorrow, and home against Nanaimo to finish the preseason on Saturday. Here's the details on tonight's Raise a Reader Road Hockey Game! I will be attempting to provide play-by-play! FRIDAY the AV Midget Bulldogs are having a BBQ/bake sale/car wash/bottle drive fundraiser at Cap-It from 11 to 4. Also tomorrow, is the FALL BASH! The Jericho Road Church in partnership with the Christian Reformed Church are hosting a FALL BASH this Friday at Jericho Road Church from 4pm to 6pm. Free food, free school supplies - while supplies last - great prizes, face painting, bounce around, and MORE! The Terry Fox run goes Sunday at the Royal Canadian Legion - registration goes at 9am with the run starting at 10:00am. 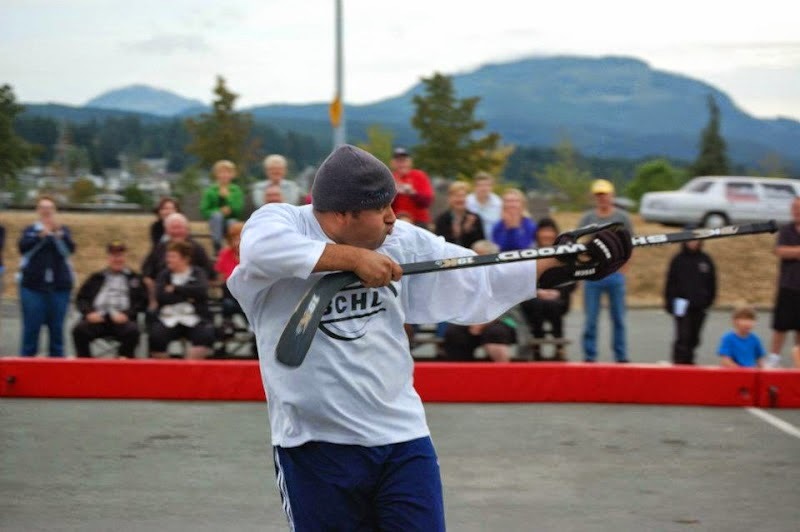 Community hero, Spirit of Hockeyville winner and Bulldogs Assistant Equipment Manager Jamie Amos will most likely once again be the local fundraising CHAMP, way to go Amos! If anyone else wins the long drive, they cheated...or I hit in in the bush!